The UCI Immigrant Rights Clinic launched in 2011 as part of UCI Law’s visionary experiential learning program. Clinic students, working under close faculty supervision, provide direct representation to immigrants on matters ranging from detention and deportation defense to workplace exploitation and protection of civil and constitutional rights of immigrants. The clinic also provides legal support to grassroots organizations working on critical issues affecting low-income immigrants in the region. The clinic strives for and models high-quality, holistic, and transformative lawyering. It acts in accordance with the foundational insight that the community is best served when lawyers help empower marginalized individuals and groups to advocate for themselves. 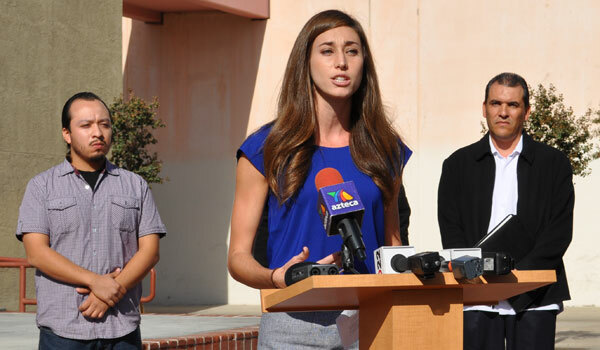 Victoria Anderson '14 speaks at a press conference in Santa Ana, where clinic students released a report showing that Orange County probation officers referred more children to immigration authorities for possible deportation than any other county in the state. Clinic students litigate on behalf of clients in federal and state courts and before administrative agencies. They develop traditional lawyering skills, such as client interviewing and counseling, fact investigation, legal drafting and trial presentation. In addition, modern legal practice demands problem-solving methods beyond those skills. Immigrant communities targeted by aggressive law enforcement initiatives have been sites of innovative social and political organizing. The clinic supports that work by partnering with organizations to conduct community education and advance policy reform campaigns. Through rigorous, structured reflection, students distill lessons about legal practice from their fieldwork. Over the past decade, the number of immigrants detained by federal authorities has grown at alarming rates. Although immigration proceedings are civil in nature and immigration detention is not supposed to be punitive, conditions can be as bad as those found in the criminal system. Isolated from their families and communities, detained immigrants face profound pressure to forfeit meritorious claims in order to remain in the United States. Since 2014, clinic students have represented and assisted detained immigrants in their efforts to obtain freedom from detention. Clinic students meet clients at the Adelanto Detention Center in San Bernardino County or at one of several facilities in Orange County. Students investigate facts, formulate a theory of the case, prepare evidence and serve as primary representatives at detainees’ bond hearings. The clinic’s bond clients include some of the most vulnerable in the immigration system— those who have survived domestic or childhood abuse, fled persecution, struggle with mental illness, are recovering from drug or alcohol addiction, or face stigma and discrimination as a result of their criminal records. Bond is often a turning point in their cases. Clients have won important relief ranging from cancellation of removal orders to the acquisition of visas. In total, students have assisted nearly 50 detainees, many of whom were subject to prolonged detention, and secured the release of more than 20. The bond project is highly regarded and has become a model for other law clinics and pro bono programs. All students handle at least one litigation case and one non-litigation advocacy project. Students work in teams of two or three on all clinic projects. With the permission of the presiding judicial or administrative officer, students serve as the primary legal representative for their clients in all hearings before state and federal courts and agencies. Foundational Lawyering Skills: Students interview clients, undertake fact investigations, disentangle procedural rules, draft complaints and legal briefs, conduct direct and cross-examinations, and negotiate with opposing parties. Through both intense individual immersion and collaborative learning across clinic teams, students are assured of exposure to a range of skills and knowledge bases. Participatory Litigation: IRC contextualizes traditional legal skills in a participatory framework and students work with clients as collaboratively as possible. Policy Advocacy: Modern legal practice requires basic policy advocacy skills, such as knowledge of legislative drafting, framing techniques, grassroots lobbying methodologies, and media advocacy, to complement litigation expertise. Know Your Rights and Community Education: Students engage in know-your-rights and community education programs, especially ones constructed to be sustained by our community-based collaborators. Lawyers and Client Mobilization: Students work with community-based organizers because lawyering alone does not advance justice. Through these collaborations, students explore the strategic and ethical challenges posed by a mode of practice that aims to mobilize clients, in addition to asserting legal rights and defenses on their behalf. Strategic Judgment: As lead counsel on multi-modal advocacy projects, students participate and contribute to the development of social and economic justice campaigns on behalf of individuals and organizations. IRC students helped 18 Long Beach hotel employees reach a $130,000 settlement with HEI Hotels and Resorts over denial of meal and rest breaks required by state law. The settlement arose from claims the employees filed with the California Division of Labor Standards Enforcement. Students Brian Olney (’13) and Angel Camino (’13) handled the settlement negotiations, and for the litigation, students Ari Yampolsky (’12) represented the hotel workers in the first set of hearings in April 2012, and David Rodwin and Emma Soichet (both ’12) came back after graduation to handle hearings for clients. Also instrumental in the case were Acrivi Coromelas, Sam Lam, David Koch and Irina Trasovan (all ’12), and the Legal Aid Society Employment Law Center.